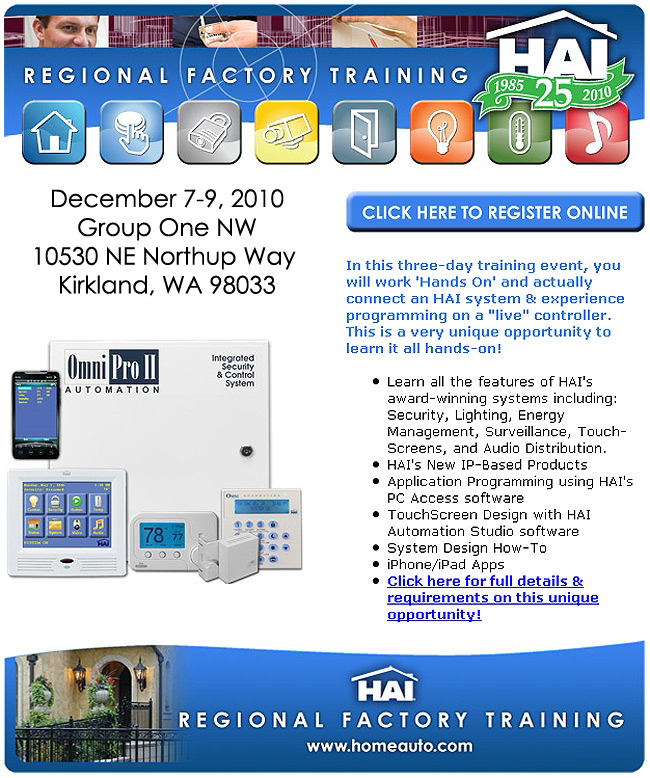 While HAI has offered factory training at the headquarters in New Orleans for many years, the idea of bringing the concept on the road will increase convenience for west-coast integrators. Trainings will be held in San Jose on October 19-21 (sold out), Denver on November 9-11, and Seattle on December 7-9. With the advent of more IP & surveillance devices in the home, installing companies have requested more complete training to meet their customers’ needs. In the “hands-on” environment, each participant is given instruction and actually designs, connects, programs, and customizes their own system in a three-day class. The courses are led by HAI regional sales managers, Ken Piazzi and Don Decock, who are automation experts with more than 40 years of field experience between them. Included in the training agenda is security, lighting control, thermostat, and energy management, camera hook ups, OmniTouch Touchscreen configuration and customization, audio distribution, and full logic programming. The class also gives the installer the opportunity to take something with them, an HAI OmniPro II home control system. Each attendee will use their OmniPro II throughout the course, and can then install it in their own home, lab, or showroom. “As the saying goes, ‘Knowledge is power’ and this three-day class will give an installer the skill-sets needed for a successful installation of any size,” explained HAI training coordinator, Bridgette Burch. To download a flyer for the Denver Course, click here. To download a flyer for the Seattle Course, click here.